Watching the daily news I saw a story about Sarah Rudder and her participation in these games. Her story and incredible strength of character is why I blog. As a Marine, working at the Pentagon on 9-11, she became a casualty when concrete fell and crushed her foot during recovery operations. With so much misery in the world, we need reminders that we are remarkably resilient humans. Sarah’s story gives inspiration that we can rise above our circumstances. 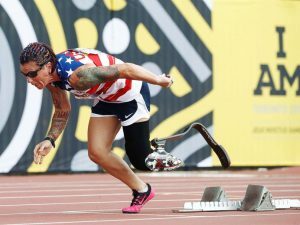 Her story is below, one of the 550 athlete’s competing, all with their own stories of overcoming adversity. Hope, strength, courage. This is what we can give to others. You’ve got this! Show up and make a difference. It does the heart good. 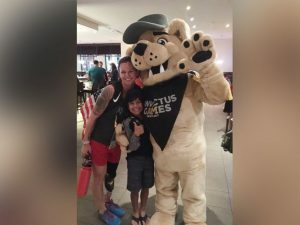 Sarah Rudder is a Marine Corps veteran, a mother, an amputee and now, a five-time gold medalist after competing in this year’s Invictus Games in Toronto. 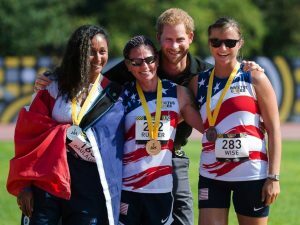 Britain’s Prince Harry, who founded the Invictus Games in 2014 as a competition for wounded service members, awarded Rudder her first gold medal. Rudder’s lower left leg was amputated in 2014, 13 years after she injured her left ankle while performing a search and rescue operation at the Pentagon after the Sept. 11, 2001, terrorist attacks. 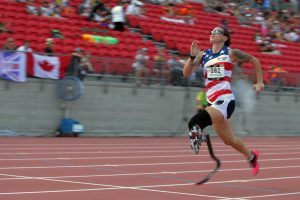 She overcame a blood clot in her first year as an amputee and found a way to heal both inside and out when a group of fellow Marine veterans invited her to start competing in sports. Rudder’s husband, sister, and parents were on hand to watch her race to victory in Toronto, as well as her 9-year-old son, Xavier. 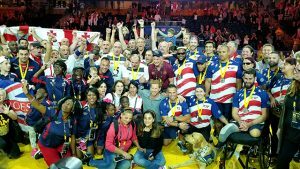 This year’s Invictus Games in Toronto featured 550 competitors from 17 nations. The athletes have spent the past week competing in 12 different sports, from powerlifting to cycling and wheelchair rugby. All 550 of the competitors are active duty and veteran service members who “have become ill or injured during or as a direct consequence of their service,” according to the games’ website. 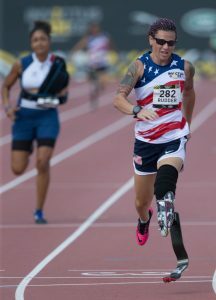 Rudder is one of 90 U.S. athletes competing in this year’s games, according to the Department of Defense. Rudder said she is especially proud of the message her gold-medal winning performances send to her son. I just want to mention I am just very new to weblog and absolutely liked you’re website. Probably I’m planning to bookmark your blog post . You really have great posts. Appreciate it for sharing your blog. When journalists write stories about people like Sarah Rudder, I wish you would do your research. As a first responder who was at the Pentagon. I can tell you, I’ve seen several of her stories and all of them are inconsistent. She is what they call stolen valor. There was no promotion at the Pentagon. She was in a alcohol related car accident a week before 9/11 and crushed her ribs, ankle and head. Rudder was going to be considered unable to deploy and ousted. She decided to use 9/11 as her cover story. Only fire, paramedics, search and rescue, were allowed. The building was unstable and even fire fighters were making police back out. It’s sad she is using this to her advantage. Not the point of my blog…..it”s about finding hope and strong women….every single person can be disparaged for some past indiscretions. Sorry about your own suffering. But, I will take your point of view for future posts. This brings me to most of my points, that “history and journalism” is full of holes and to not believe everything you read or hear….your own prejudices will cloud what you take in. I just want to say I am just all new to blogging and site-building and truly savored you’re website. Almost certainly I’m likely to bookmark your blog . You actually have awesome writings. Thank you for sharing with us your blog site. I simply want to say I am just all new to weblog and truly loved this page. Very likely I’m planning to bookmark your site . You really have superb articles. Many thanks for sharing your blog site. Journalism is about getting the truth of stories. Not doing research on what you are told is another thing. There is no good story on here. You need to see the real story. For Sarah to still the light from the real hero’s is absolutely disgusting. Here she is pictured 5 FIVE days after “she shattered” her leg on 9/11. Please tell me where her leg is injuries. You know she was a correction officer after this. Her leg wasn’t amputated until 2014. She’s STOLEN VALOR and I have a problem with it, when she took hundreds of thousands of dollars for sponsorships. How do you think real combat Marines feel. Did you know she was in a DUI accident a week before with her husband Marcus. She was actually restricted to the barracks. She some how miraculously ran from the smoke deck to save lives. Stop making this imposter anything what she is. A COWARD who is taking money from veterans who were actually injured in combat. After learning more about her, I would have used a different example. However, her accomplishments here cannot be diminished, and since none of live inside her head and what it’s had to endure, I give her a pass. Sorry….I believe in people who rise above their circumstances, and she has. Thanks for your thoughts just the same.